What better way to welcome her than a Blog Hop! Here is a look at the stencils that Traci has designed. They are all live and ready to ship on our website TODAY! Take it away Mary Beth! If you can't see video, please click HERE. Before you do, make sure you enter the GIVEAWAY!!!! GIVEAWAY will be open a full 2 weeks! Mary Beth has a webinar on July 24th and her guest????? Get all the info HERE! If you don't already, we would LOVE if you would sign-up for our newsletter HERE and follow us on the following Social Media sites to get the latest StencilGirl news! Facebook, Google+, Pinterest and Bloglovin and YouTube. As I'm waiting for Traci Bautista's latest book to be delivered to my door I'd be delighted to win a set of her stencils. Thanks for the chance to win. I can see I'll soon be placing a new order at www.stencilgirlproducts.com! Traci's designs are beautiful! These are cool, love that floral 1. I have a loyalty coupon at the end of July which i think will be put to good use soon on this new release! Thanks for the giveaway. Welcome to StencilGirl, Traci! Love all your new stencil designs!! Woo-hoooo!!! Love Traci's work!! The new stencil designs are just awesome! I absolutely love the stencils and Traci and want to start using them now!!! What a wonderful combination of creativity and quality. Thank you! Happy dance! Great stencils! I want EVERY ONE! Wow! Gorgeous stencils by Traci Bautista, and loved YOUR pages using them! Just gorgeous! Love Traci! Can't wait to play with the new designs! I enjoy Traci's creations and now can enjoy her stencils! Traci is one of my favorite artists. Love her new stencils! I have followed Traci for years and am excited to see her new line of stencils! MaryBeth, I just wanted you to know that not only is Traci a rock star but YOU are a rock star! It is my sincerest wish to meet you in person some day. Fabulous stencils, would be so happy to have them. Appreciate the opportunity! Congrats Traci and fab stencils!! Traci's designs are beautiful! What a wonderful collaboration of creativity and quality! I appreciate the opportunity to win a set :) thank you! Fabulous - I love them all ! Yay! I love Traci's designs and her new stencils rock! I'm waiting for her new book to make it to my doorstep and being able to use her stencils will be a wonderful opportunity! Welcome to StencilGirl! I love everything Traci does.. and these stencils are no exception!! I just ordered mine. Congratulations traci! What a sweet welcome video Mary Beth did for you! Can't wait to see what everyone does with your fantastic stencils! Oh and thanks for the opportunity to win my own set! Those are some awesome stencils. I've been wanting to try bold stencils, so this would be a perfect start for me. I love how there are no rules. Enjoyed Traci's creations and now can enjoy her stencils! Thanks for sharing your ideas..
Traci... 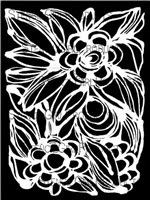 I love your work and am thrilled that you are designing for StencilGirl! Your new stencils look so cool and I would love to have a set to play with. Thank you for giving me and everyone else this chance to win a set! I've been a fan of Traci's for a long time - love her style and these stencils are awesome! Those stencils are SO Traci! I've signed up for the webinar and can hardly wait. Really fun blog...I've completed the whole thing. Inspiration....awesome. I'll check out the webinar information next. thanks for sponsoring these artists. Stencils look great. Would love to try them.....soon! Wow! 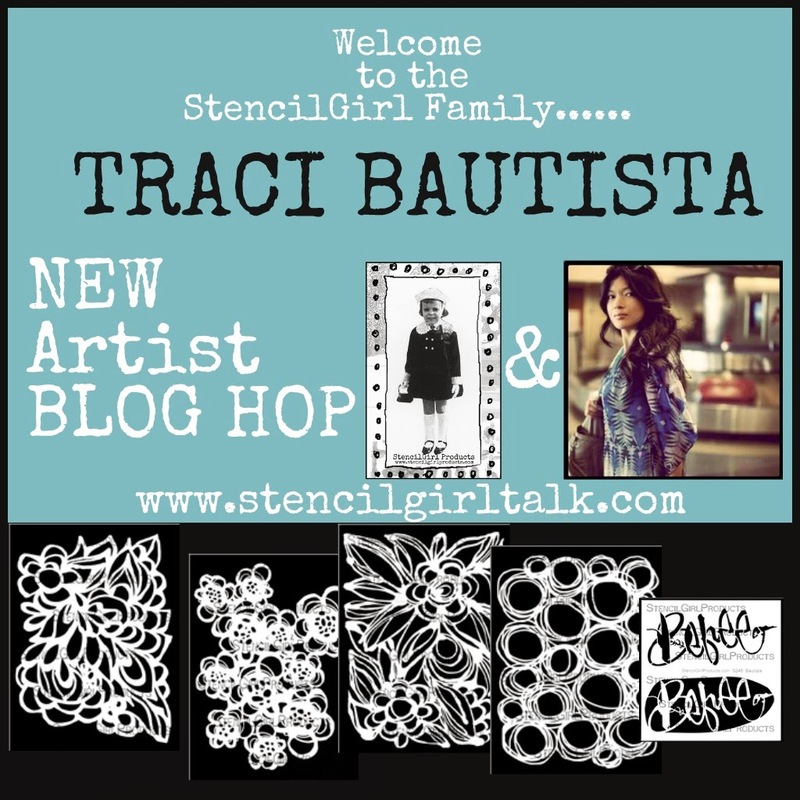 This is so exciting to have Traci Bautista and StencilGirl together. Mary Beth, I got chills when you were describing how cute Traci looked the first time you saw her! So glad the time was right for both of you and we get to share along with you. Traci + StencilGirl = pure kismet. Can't wait to see what everybody has done with Traci's new stencils for Stencil Girl! Congratulations to both Traci and Stencil Girl for introducing these fun stencils to me!! Love the new stencils, they look great! Great new stencils. Congrats to all involved. love the awesome stencils and thanks for a chance to win! How awesome! Love Traci's creativity. I have her Doodle book and was just reading through it this week! Thank you for the chance to win! Great story of Traci. Thank you for launching her stencils - they look amazing! Oh my goodness! What wonderful designs!! These are way to fun. thanks as always for sharing. These are fabulous stencils! Thanks so much for the opportunity to win! Traci is all about having FUN! Love the stencils/masks! I love all the stencils but the floral ones are my favourites. Very cool stencils! All sorts of possibilities! Hi, Mary Beth! I'm all set for your webinar...and anxious to know you better both here and wax centric. I love the free flowing movement of these stencils! THanks for the opportunity to win! Great introduction of Traci Bautista. Her stencil design is wonderful. Just saw one on Carolyn Dube's site. Now I have to check them all out. Thanks for sharing. I love these stencils! Circles Circles is my favorite.. I think! This is super exciting! I love these designs, especially the circles. Thank you for signing Traci up! This is so exciting. I love Traci and her creative art. I cannot wait to play with all her new stencils. Thanks for the opportunity to win these stencils. Traci's stencils are very cool! I like the flowers. They would make great gelli print backgrounds! Thanks for the hop it was amazing to see what everyone did with these stencils. I love Traci's designs. So many ways they can be used in journals, on cards, and so on. I first discovered Traci in a free how to on Strathmore and fell in love with her techniques. I also bought a video at Paper Cloth Scissors and watch it and play along with her. It would be awesome to win her stencils! Thanks so much for the chance! MB you are so funny! I love your description of meeting Traci for the first time. I love love loved working with her stencil and want them all! Traci, I love your designs! I have been waiting for Traci to come out with her line of stencils. I'm a big fan and have all her books and have several of her on line classes. Thanks for the chance to win her stencils. These stencils look amazing and I love seeing what everyone is doing with them on their blogs! Love Traci's art and adore her new stencils! The art created with these I have seen so far is amazing- another fine bloghop Stencil Girl!! Beautiful organic stencils, just my cup of tea! Love Tracy's style... can't wait to check eveyone out!! Great Release, Congrats Tracy on being featured, what an honor. It was a great hop, lots of talent and awesome idea. Beautiful stencils, I can see so many uses for them. Love! Love! Love! I need ( not just want) all of them! I love Tracy Bautista's art and can't wait to incorporate her beautiful designs into my own art. Beautiful stencils, I am excited to try them. I already have so many ideas on how to use them. What a sweet giveaway! 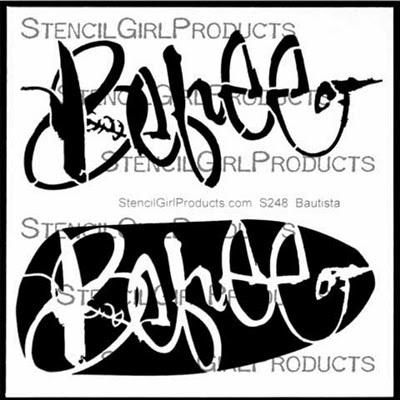 So cool to see new designs and welcome to Traci to the Stencil Girl family! Cool new stencils! Love Traci's style and so glad she is making stencils now! Nice project....love the circle stencil. Now these stencils... I would love to win. They are just beautiful. What a great blog hop.. I"m not done, but so far.. so great. It is SO exciting to have Traci here!!! WooHoo….and doesn't she make a great set of stencils? Most exciting stencils I have seen in ages!! Oh wow! I LOVE Traci Bautista, and these stencils are the BOMB! Do I "need" more stencils? No. So what! The more, the merrier! LOL! These stencils look like so much fun! What beautiful stencils!!!!! LOVE them! what fun looking stencils!!! congratulations to Traci Bautista for joining stencil girl. Can't wait to try them.....they look like so much fun. Wow I love Tracy's designs and her stencils look so fun, just like the beautiful artist that is Tracy! How lucky we are to get to play with stencils designed by a super rock star! Fabulous! Thank for the giveaway! Very cool!!! I love these stencils. Very flowing and free-form. I'm just getting into stenciling and enjoyed the tips and techniques I picked up along the way today. Thanks for having the hop. Love these new stencils! I took a class from Traci at Art and Soul several years ago. I had a great time and learned so much. I would love to have a set of her stencils to play with in my art journal. thanks for the amazing and inspiring blog hop showcasing Traci's new stencils - love love love them all and to win a set would be FANTABULISTICAL !!! Congratulations, Traci! Your stencils are great! 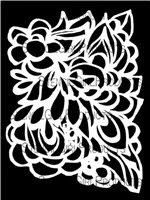 Love the new stencils from Traci and so happy there is a blog with a chance to win some! Great stencils I'd love to win a set. Love Traci, love these stencils! Must have them! 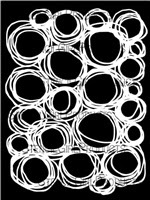 Just got Printmaking Unleashed and look forward to getting some of these stencils! This is a fabulous set of stencils. I particularly love the large flowers and circles ones. 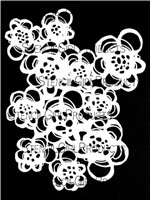 I love the Circles, Circles and Floral 1 stencils the most. The whole set looks like a lot of fun though. so inspired with these stencils - love the chance to win a set! I love Traci's work and I am glad to see her join SG the stencils are so unique. Thanks for the chance to win. Very useful desgns in your stencils. I'd love to win them! Absolutely love theses stencils and can't wait to give them a try! Love Tracy's work/style and so happy you have made her part of the Stencil Girl family! Can't wait to het my mittens on these beauties. Love the "looseness" of these stencils. Always have liked Traci's style. Just bought her new book, so need the stencils, too! Awesome stencils, and I am (as always) so impressed by how creatively the artists in the blog hop have used them! Just finished the webinar. I can see how these stencils may have begun with hot glue play. They are wonderful and I would love to play with them. Great stencils! Can't wait to try them. More ideas to expand your learning. Today I enjoyed my better-late-than-never viewing of the webinar, since I was unable to be home to watch the live version. Mary Beth, your webinars just keep getting better all the time! And I'm glad to hear there will be another one in a couple of months. I wasn't able to attend the live webinar, but when I got the follow-up email earlier today with the links, I immediately popped over to listen and watch. The two videos were terrific and taught me so much more about materials and techniques. As soon as I get a few new stencils and the page protectors, I'll be making skins - waahoo! Your so sweet, what a wonderful welcome for Tracy!